Signs you need a new roof – The first thing you need to know is whether you need a new roof in the first place. We recommend a roof replacement if your roof is over a decade old. You should also have it replaced if you see these signs: missing shingles, curling shingles, buckling shingles, loose flashing, and granules in your gutter. If your roof leaks, then you are also a good candidate for roof replacement. Working with the right contractor – Your choice of contractor has a significant effect on your roof’s performance and on the length of its service life. The right contractor has decades of experience, proper licenses, certifications, and insurance. As a specialist in roofing in Detroit, Kroll Construction qualifies. We have helped countless homeowners with their roofing problems through the decades. Roof colors and roof designs ­– Your roof is one of the most visible parts of your exterior, so it needs to look great with the rest of your home. Consider studying basic color theory so you can match the right roof color with your siding, trim, and window colors. We also recommend researching your home’s architectural style. Certain color combinations look better on particular home styles. Parts of your roof – Your roof has many parts, and you need to have a basic understanding of how it all works. Your roof has a roof deck, underlayment, ice and water shield, starter strips, shingles, flashing, and ventilation. These components work together to protect your home. 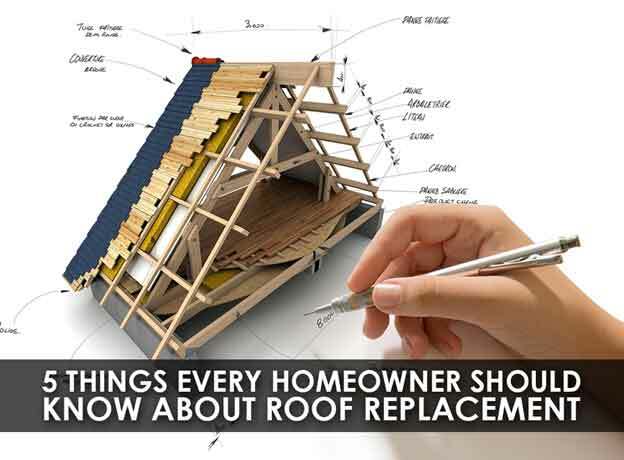 Studying them will help you select the best roofing products for your home. Managing your roof replacement – You need to work with your contractor to make sure that your roofing project goes smoothly. Communicate with your contractor and attend regular meetings with them. Ask questions and voice your concerns to make sure that everyone is on the same page. Prepare your home for roof replacement by protecting your furniture and removing valuables from your home. By researching and learning about roof replacement, you’ll be able to manage your roof replacement project more effectively. As long as you work with the right contractor, your roof project will be quick, efficient, and stress-free. Kroll Construction is one of the most experienced roofing contractors in Detroit. We have over 50 years of experience in replacing, repairing, and maintaining our customers’ roofs. Call us at (888) 338-6340 to learn more about roof replacement. You can also schedule a free in-home consultation.